The day before we left Wakayama we went to the kids museum, it is a bit tatty round the edges but had plenty of hands on stuff for the kids (and parents) to enjoy. 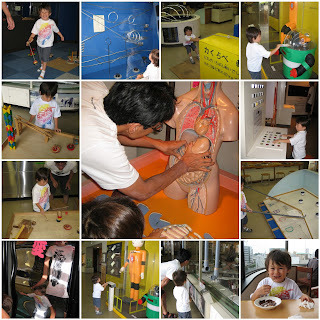 Not only does it have lots of science experiments set up but they have traditional Japanese toys and a planetarium (we we didn't visit). It was a good way to kill a couple of hours and Ebi-kun gave it the thumbs up! I would like to nominate you for the Honest Scrap Award. Details are located on my blog. Thanks for a great read.